← Chocolate Strawberry Layer Cake! 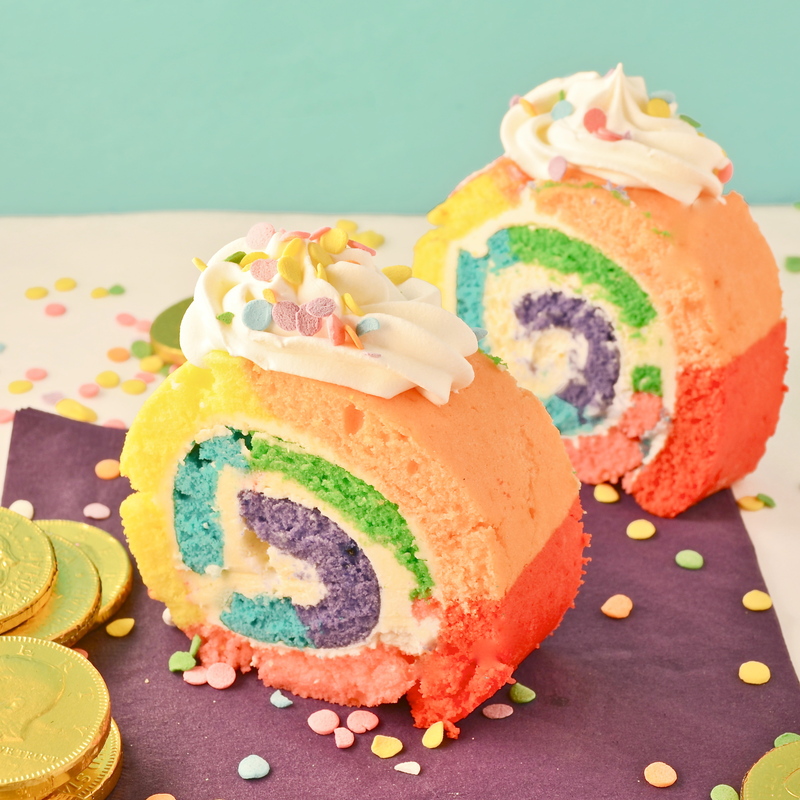 Fun rainbow-colored cake swirled with rich buttercream- a perfect St. Patrick’s Day treat! I had so much fun making this cake this cake was torture. I love cake rolls like crazy, but I could not find a recipe that tasted good AND didn’t crack terribly when rolled up. I tried 4 recipes and finally settled on plain old cake mix again– it still cracked, but tasted soooo yummy and it was definitely the easiest. I hesitated to post this, as it is essentially a recipe experiment *fail*, but then I thought it would be a good chance to ask all of YOU if you have a fail-safe vanilla cake roll recipe…? I love the technique and the colors- I just need a good recipe. 1. Use my buttercream recipe. When it is refrigerated it gets nice and hard, cementing your happy little cracked roll together and holding it together even at room temperature. 2. Set aside several hours and take your time. 3. Use color gels. 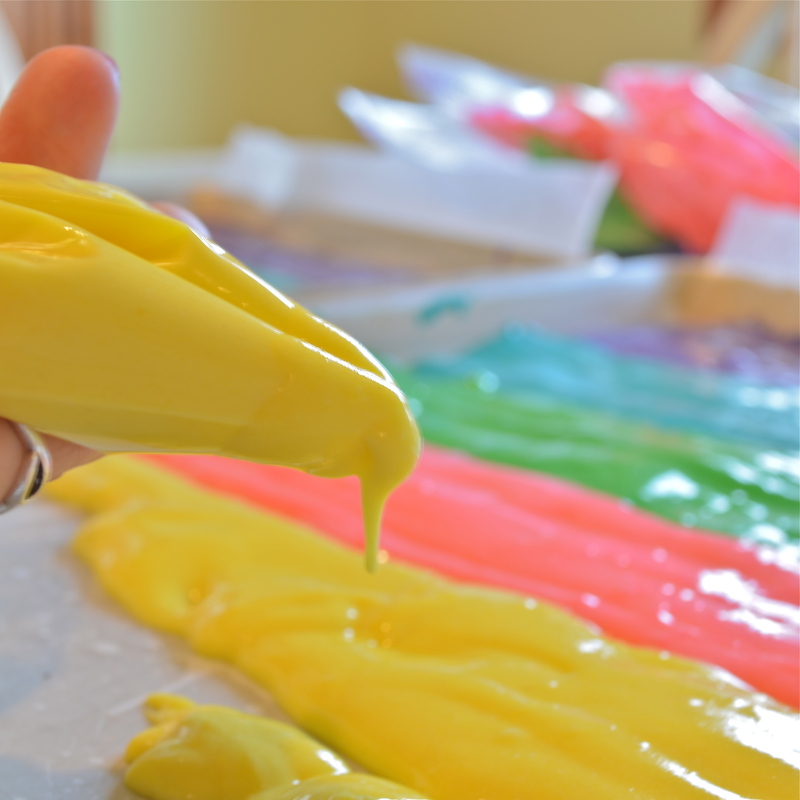 You will not get the vibrant colors with liquid color. Honestly, people loved this cake. Once it is cut you can barely tell it cracked. I made this one for my friend Dawn’s birthday and it was such a fun and cheery cake. She only likes white cake with vanilla frosting…this is a great way to spice up that combination with color! Cool Whip Topping and sprinkles for garnish. 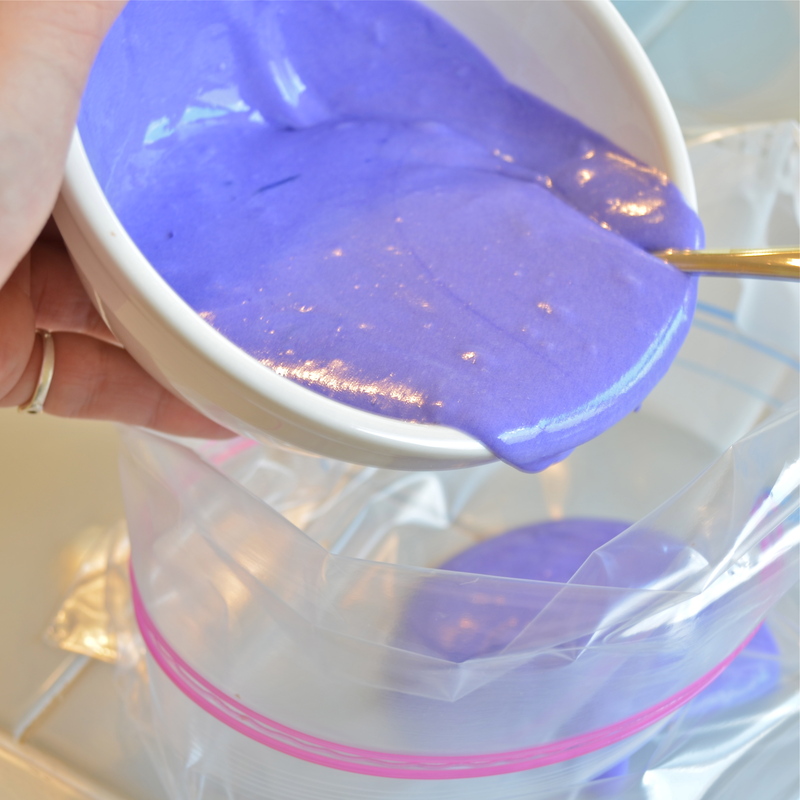 Scoop about 3/4 c. of mix into 6 or 7 small bowls and color as desired. 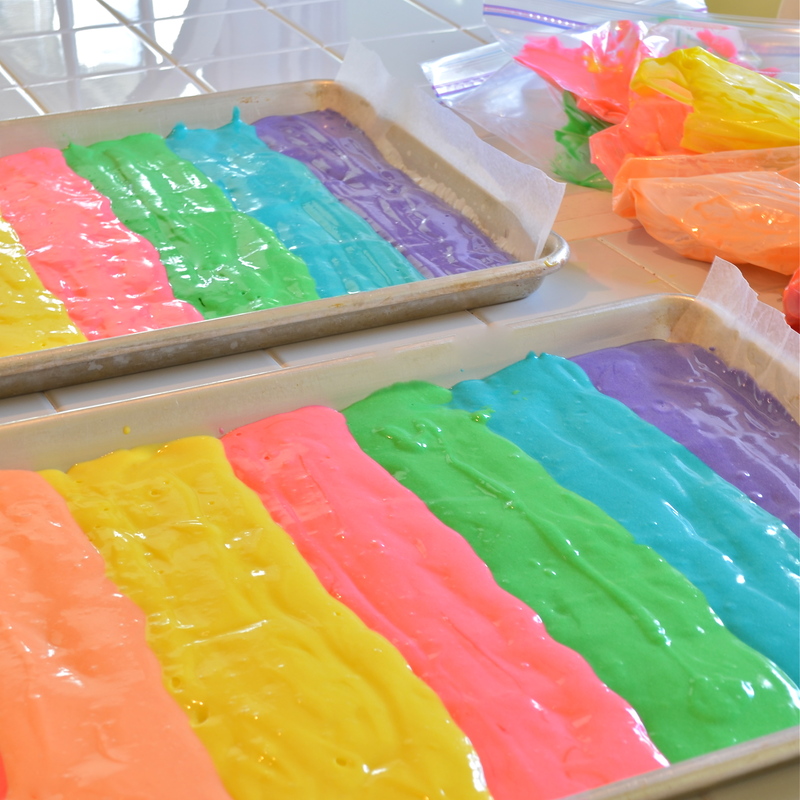 Spoon each color of batter into a small ziptop bag and gently pipe colors into pan in stripes. Just settle in and take your time here. This is a labor of love. 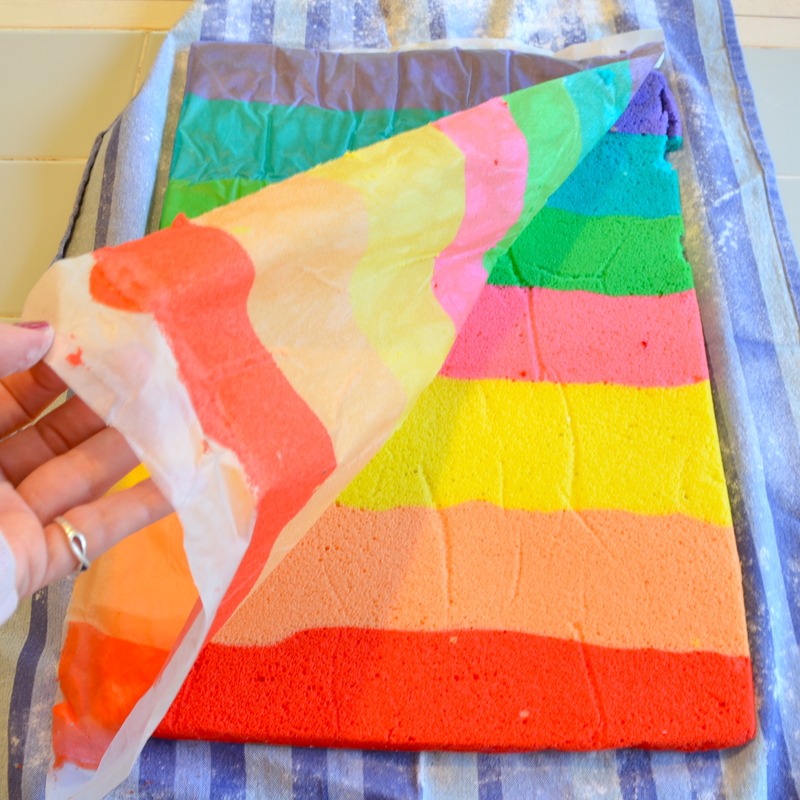 Use paper towel to wipe up drips and remember that you are piping a THIN layer of cake– you don’t want to make it so thick you run out before you get to the end of the pan. Patience is the key…believe me, I’ve done this 4 times now with different cake recipes and it just takes time. Bake your cake at 350F degrees for 12-15 minutes– check often- you can’t roll a crunchy over-baked cake! Remove from oven and place a clean towel that has been sprinkled with powdered sugar over the roll. Tip the pan over onto the towel and peel away the wax paper. 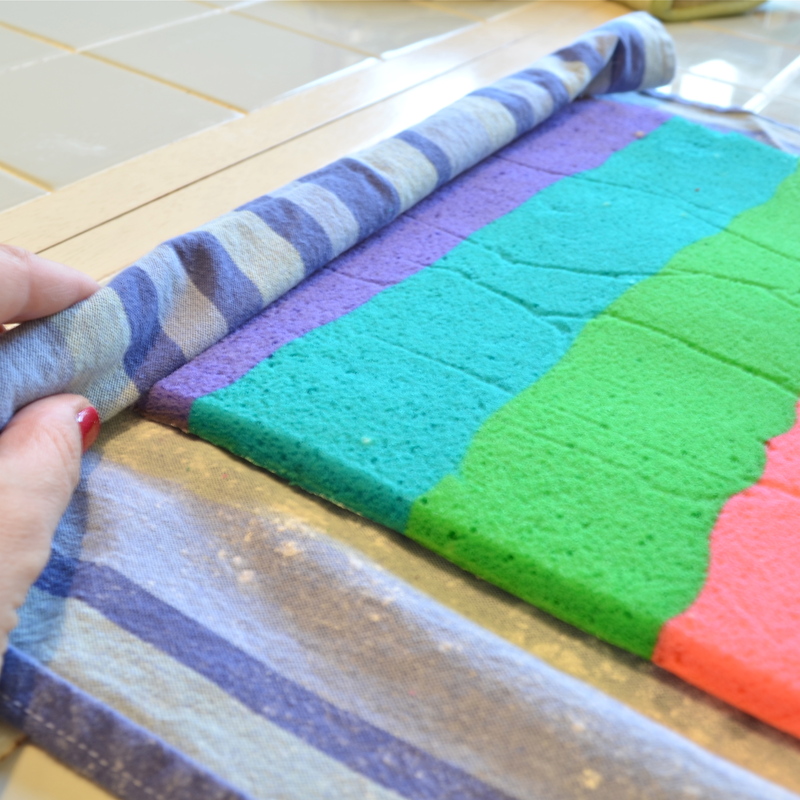 Gently roll cake up in towel from one short end to the other. While cake is cooling, make buttercream icing. Put softened butter, powdered sugar and vanilla in a large mixing bowl and beat on high until light and fluffy. VERY carefully, spread buttercream over entire surface of the cake and re-roll. I had cracks that went the entire length of the cake and still just gently rolled it together, letting the buttercream hold it together. Gently place on a plate and refrigerate until buttercream hardens. Not perfect, but so much fun! Posted in Cakes and tagged baking, birthday cake, buttercream frosting, buttercream recipe, cake, cake roll, colorful ideas, dessert, food, fun cake, fun dessert, Rainbow, rainbow cake, rainbow cake roll, St. Patricks Day, vanilla cake, vanilla frosting. Bookmark the permalink. Oh my!! This cake is so pretty! Your friend is really lucky! Thank you– and I’m actually the lucky one– Dawn is a wonderful friend!! Thats a great story— cracks me up– (no pun intended! lol) Thanks for sharing! That looks awesome! I love that kind of things too, but you have to be very experienced for that. You are a big talent!! Oh…I wouldn’t say I’m terrible talented– maybe just persistent– haha! Thank you! Your cake is beautiful, I make rolled cakes on occasion, usually chocolate but here is a link to the recipe I always use from Martha Stewart. It usually works well with only an occasional crack. 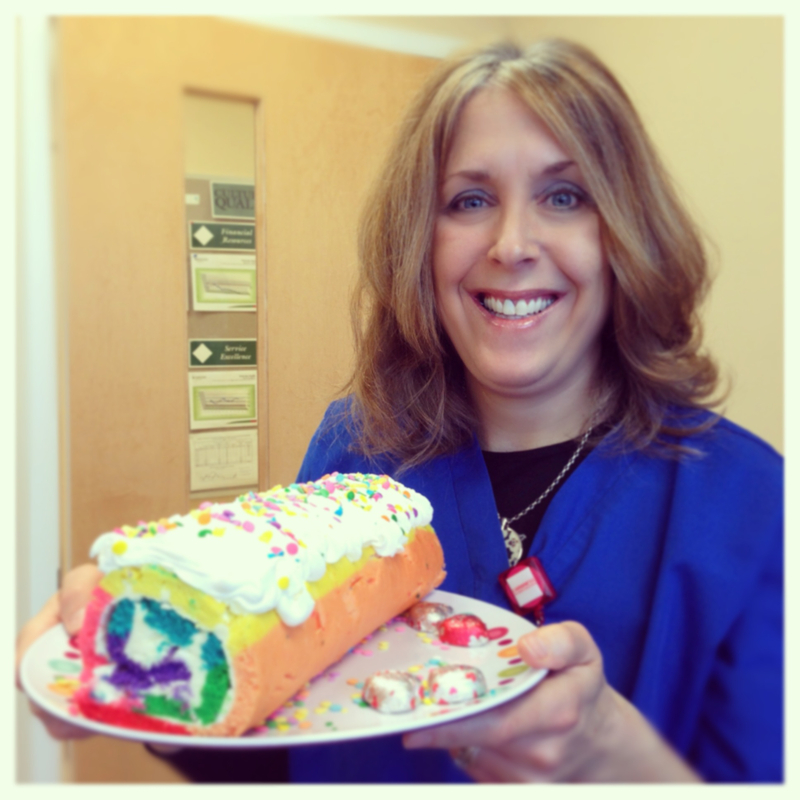 Love the colorful cake you made and it must taste amazing. Thank you!!! I recipe by Martha HAS to be a good one–right? I’m going to check it out as soon as I’m done reading comments!! how fun! i love the colors and this is a great way to get every color in every bite! 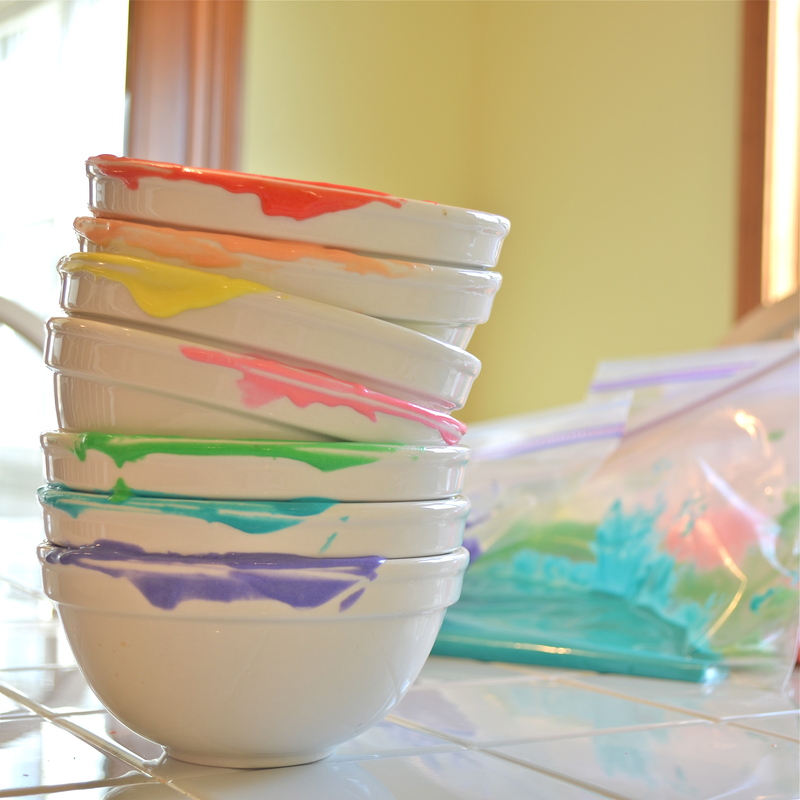 Thanks Jess— I loved working with all those fun colors– even if they do means lots of dishes- lol! You enjoy your weekend too!!! Great idea! It looks so fun and colourful! 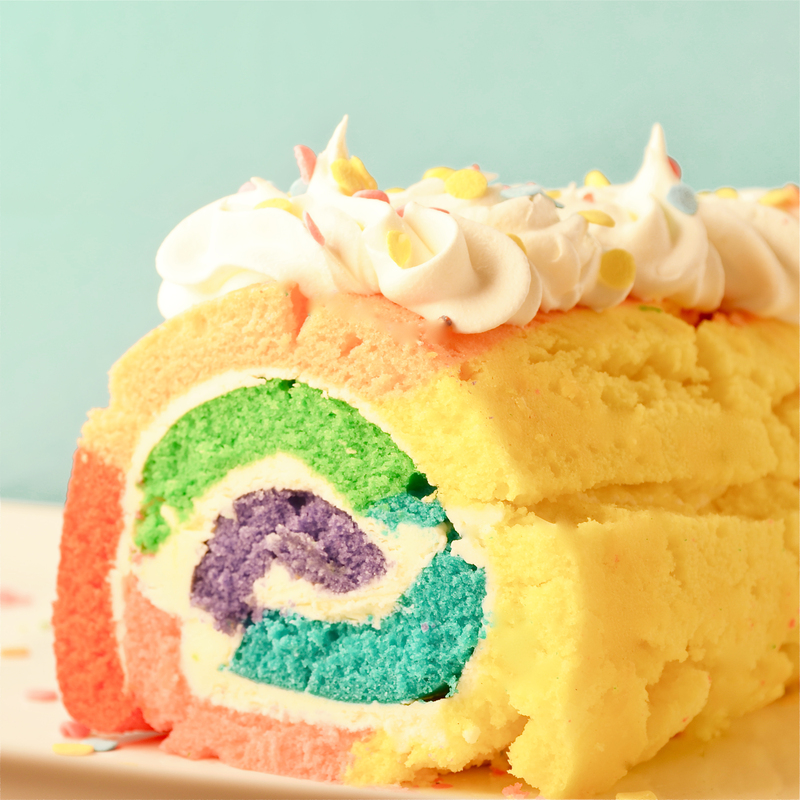 This is a gorgeous rainbow cake roll! Lovely colors. I’m loving your photos, especially the first one. Thanks for sharing! change the frosting color to match the holiday. I have made Yule logs & pumpkin roll ups many times & they crack, too. I f you use your buttercream or chocolate buttercream frosting to frost the outside of your cake nobody will know your cake cracked. They will just be amazed at your creation. You can then add your sprinkles or spearmint gumdrop leaves & red gumdrops to look like holly berries. Great tip– thank you so much!!!! I’ve never made a cake roll, but with pumpkin rolls I lay out a damp rag sprinkled with powdered sugar and flip the pumpkin cake out on that, then I roll the cake up in the rag and leave it be for half an hour. Then I ice it.